I am working on a site (modestoheatandair.com) in which I would like to remove the link from the Services link because there is a drop down and I want people to only be able to click on the links in the drop down. Please help me make this change. Go to Appearance –> Menus and remove the URL of Services menu. Then hit Save Button. Thank you for the reply, however I do not see the URL field in the menu section. I am only given Navigation Label & Title Attribute. ..however I do not see the URL field in the menu section. I am only given Navigation Label & Title Attribute. Use Custom Links. Not, Pages itself in custom menus. 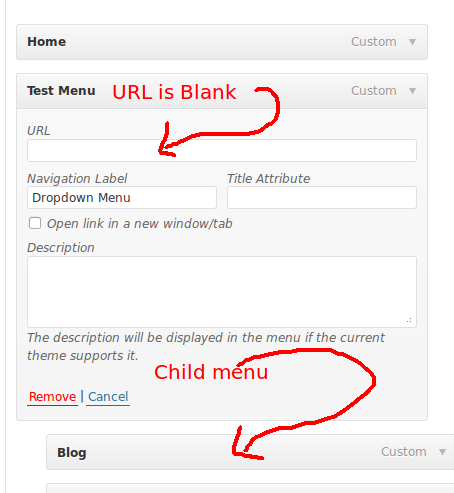 Once you Add a Custom Link to the menu, you can then remove it’s URL in the RHS column.